Hannspree AD32UMMB review | What Hi-Fi? Hannspree is a relatively new brand, launched out of Taiwan back in 1998. Making something of a name for itself for some outlandish TV designs – apples, footballs, and even the ‘Hannsgiraffe’ (think furry TV) – the company has also added plenty of more traditional sets to its roster. The 32in Hannspree AD32UMMB has a knockdown price, a raft of features – and a more typical television design. There’s still room for a curveball, though. This Hannspree allows you to connect a USB stick to act as storage for basic PVR functions, record, pause and ‘time-shift’ chasing playback. You can play back video, images and audio via USB, too. As well as the USB input, you’ll find three HDMI inputs, and component, scart and PC connections. A headphone output and digital optical audio connection complete the set. As you might expect considering the price, the rest of the specs are a little underwhelming. It’s an HD Ready rather than Full HD set, with a 1366 x 768 resolution, and you’ll have to settle for a basic Freeview tuner – so no HD channels. 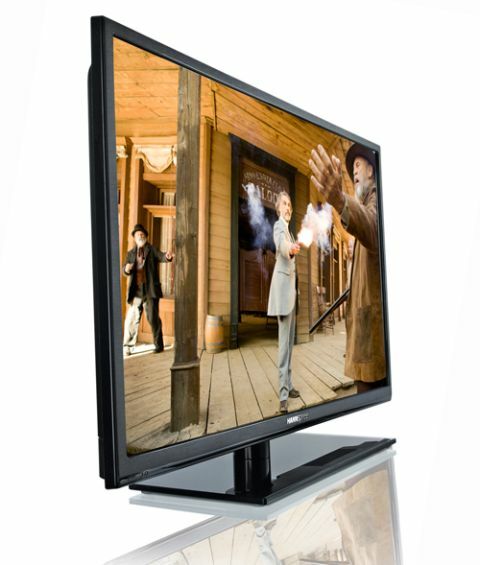 Out of the box, this Hannspree does its level best to make you forget quite how affordable it is, with a slim bezel and shallow profile combining to make an easy on the eye, compact 32in TV. The pedestal stand looks the part but you can’t swivel the screen, and the remote control is workmanlike. Watching Freeview, our first impressions are positive, with one caveat: this is one of the weaker sounding TVs here – thin and a little on the scratchy side. The picture makes up for that, though, with subtle colours and solid black levels making for watchable images. Feed the Hannspree a film and those deep, true blacks are the highlight. Other sets here tend to struggle with delivering low-light scenes, but this LED-backlit set does a fine job. You do lose a touch of insight as a trade-off and detail levels are a little off the best, though. And, as with all these sets, fast motion isn’t faultless. The lower resolution screen and a slight drop in ability in terms of detail retrieval means this TV doesn’t get the best out of HD sources. Blu-rays look better than SD of course, but not as noticeably as other screens here. The AD32UMMB isn’t a jack-of-all-trades. That said, it looks the part, has a good Freeview tuner and the bonus of recording to USB. It’s a solid performer.